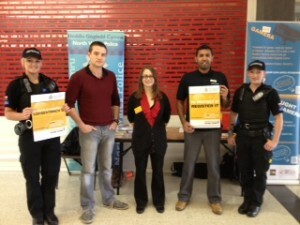 North Wales Police lend their support to the Immobilise National Property Register. An initiative which is aimed at helping to reunite owners with lost or stolen property is to be launched in Bangor. The Immobilise register is an online tool where people can register items such as mobile phones free of charge. Once an item has been registered, officers can access the database to trace the owners of any property they may recover. Other valuable items such as iPads, laptops, iPods, game consoles, cameras and satellite navigation systems can also be registered with Immobilise. said Chief Inspector Andrew Williams from North Wales Police. We are urging people to register their property, in particular items such as mobile phones onto the Immobilise database. It only takes a few minutes and if your property is stolen and later recovered, there is a greater chance of it being returned. The more people that register their phones on the Immobilise website, the better chance we have of tracking down criminals and returning stolen property back to its rightful owner. Immobilise has been used by different police forces all over the country and has proved to be a popular tool in deterring crime. Many stores in Bangor are supportive of the scheme including Tesco, Currys/PC World, Argos, Phones 4U, Get Connected, Orange, Carphone Warehouse, Three and Mobilia. They have all agreed to distribute Immobilise leaflets to anybody purchasing a mobile phone from their stores. We are very grateful to the stores for supporting us with promoting this initiative. Together, we can take positive steps to deter the buying and selling of stolen goods. Register your property free at Immobilise and improve your chances of getting it back if it’s ever lost or stolen. 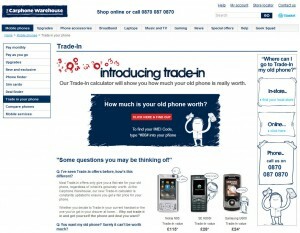 As of the 8th June The Carphone Warehouse have extended their trade-in scheme to include iPods and GPS equipment. Every item is checked in real-time on Recipero’s CheckMEND due diligence service. The system has been integrated with Carphone Warehouse’s EPOS systems in over 800 UK stores, their website, and direct sales channels, allowing them to ensure only ‘bona fide’ customers can benefit from their trade-in offers. With nearly 50 billion items of serial numbered goods recorded CheckMEND is the world’s largest database of stolen goods, making it an obvious partner for Carphone Warehouse. For those of you who have heard about it, but wondered what CheckMEND is and how it came about I thought I would give you the low down on why and how it all began. In 2000 I lost my phone on the London Underground and went to the lost property office to try to find it. However, I was then faced with the task of providing a serial number or what we also know as the IMEI number. But in 2000 no one had really heard of what an IMEI number was let alone know their own! Anyway after eventually finding my IMEI number and recovering my phone, I realised that all modern consumer electronic products have a unique serial number and that without them there was little way of distinguishing one item from another. Thus, I formed the idea that there was a need in the market for a pre-loss or theft registration service containing these serial numbers. 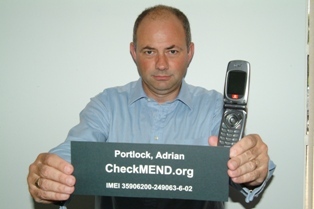 My career has always involved providing services to the consumer, back in 2000, at the age of 40; I sold my chain of restaurants, bars and leisure facilities, with the aim of taking early retirement and relaxing after a very full working life… until the idea for CheckMEND hit me. I decided to start up a company called Recipero (latin meaning to retain or recover), with a view to building a company that provided a range of products and services based on the accumulation, organisation and analysis of information relating to personal property ownership, associated criminality, fraud and illegal trading. The starting point was with a simple pre-loss registration database, but it quickly became apparent that there was value in the analysis of the data and potential to provide HPI-type data for consumer electronics. This was reinforced at the time with the explosion of online auction sites and the willingness of people to buy and sell second-hand goods online. All at the same time as the huge increase in the theft of mobile phones and other mobile devices such as laptops, ipods and the like. The next three years was spent populating the MEND data warehouse and building partnerships across the mobile industry, with the likes of Carphone Warehouse and mobile phone networks. The police forces were also a vital partner for me. Eventually, the system grew and now contains billions of pieces of discrete information and is accessed over a million times a month by the mobile phone industry, all UK Police forces, major insurers, the second hand trade, recyclers and the public. CheckMEND.com was launched in 2006 and the CheckMEND database is now used extensively by second hand trade and the public the most common use of CheckMEND by the general public is for when they are buying or selling items from online auction sites like ebay. I can now safely say the company is well established and we are starting to focus on business outside the UK. 2008 will see two new launches for CheckMEND.com. One in the US, which the Recipero and CheckMEND teams are extremely excited about, with the U.S. being the largest market for consumer electronics. Not only that, we have already begun the process of launching in Asia too.